DC Direct has adopted quite an ingenious strategy in recent years by revisiting some of its earlier statue works and reproducing them as mini-statues. 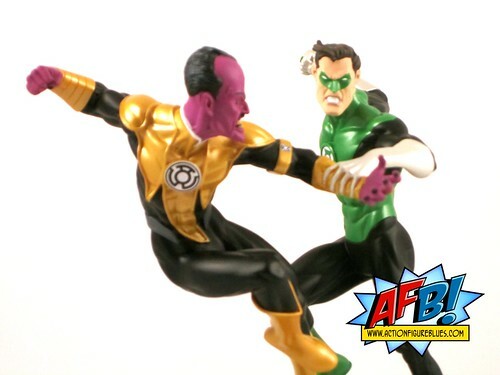 Up for review tonight we have the DC Direct Green Lantern vs Sinestro Mini Statue. In principle, I really like the mini-statue idea. It gives collectors an opportunity to add items to their shelves that cost, space or availability might otherwise prohibit. Having come to DCD statue collection after the time of most of the larger multi-character statues, so this is a fantastic opportunity to back-collect these pieces without breaking the bank. The most pleasing thing about the mini statues to this point is that almost all that I have seen or purchased lose none of the detail of the original despite the reduction in size. The Green Lantern vs Sinestro is the most exciting release in this line to date. This is a beautifully designed and conceptualised piece which shows Green Lantern and Sinestro in battle above a mountain range. I'm always talking about dynamic poses - well you can't get more dynamic than this! The structure of the piece provides several angles for display depending on which character you want to highlight. 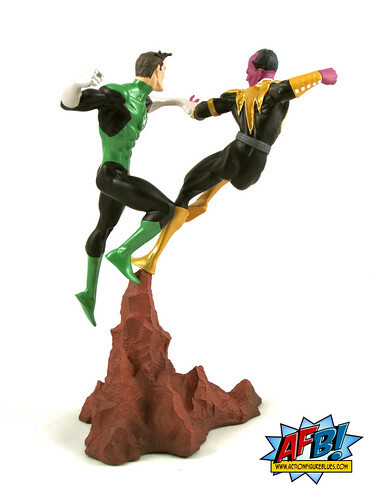 Sinestro is the character that anchors to the base of the statue, while Hal is grasping his enemy's arm and is otherwise suspended in the air. This creates a potential issue I'll talk about later, but from the aesthetic perspective, it looks great. Each character has a brilliant head sculpt and facial expression, which means that you can see the depth of the conflict in all levels of the statue. Sculpting and paint are both top notch on this piece. The statue feels highly detailed despite its size. Both of the uniforms have sculpted elements as well as painted detail, which adds to the sense of depth. The paint is very neat with clear lines, and excellent choices of surfaces and sheen. There are some nice metallic elements but this is not overused. I have two issues with this statue. The first is the change in the design of the statue from the original. 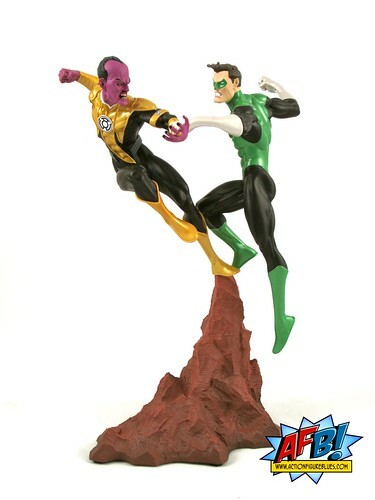 The large version of this statue had Sinestro in his classic gear, while the mini version has been updated to his Sinestro Corps garb. I'll always lean towards the classic rather than the modern, but to be fair I can see why this update was made considering the popularity of current Green Lantern storylines. The second issue is a design issue, and one that I know has been a concern with the larger version of this statue and other "Vs" statues that DC Direct have produced. This is actually the second version of this statue I have owned - the first version cracked apart at Hal's wrist when I tried to assemble it, woth Hal's forearm splintering into pieces that couldn't be glued back together. That wasn't a happy moment, and occurred without me putting any undo force on the statue. The second version assembled intact, but I have already noticed a tiny fault line in Hal's wrist which I'll be keeping a very close eye on. These toes of poses we obviously ambitious, but it's a concern if design of the piece can't actually support the weight of the elevated figure. This last issue obviously adds some reservation to my recommendation of the statue. I don't feel convinced that this piece is going to last the test of time, so you need to keep that in mind when considering to purchase. The price point isn't huge for a statue, and worth it if you're dedicated followers of the characters, but I have to advise some caution. A shame, too, as it is a beautiful statue. Next up in the DCD Mini-Statues line is Superman vs Wonder Woman. I'm keenly looking forward to this and very hopeful that there are no structural issues this time around! It is very nice looking but from what you said they can be somewhat fragile which would be a worry for me. A great piece to be sure. But I think they used Mattel's "Quality Assurance" team to get it out the door.